During several upcoming Saturdays, students, faculty member, staff and community members can access free tax return preparation help while accounting students gain valuable, real-word tax experience. 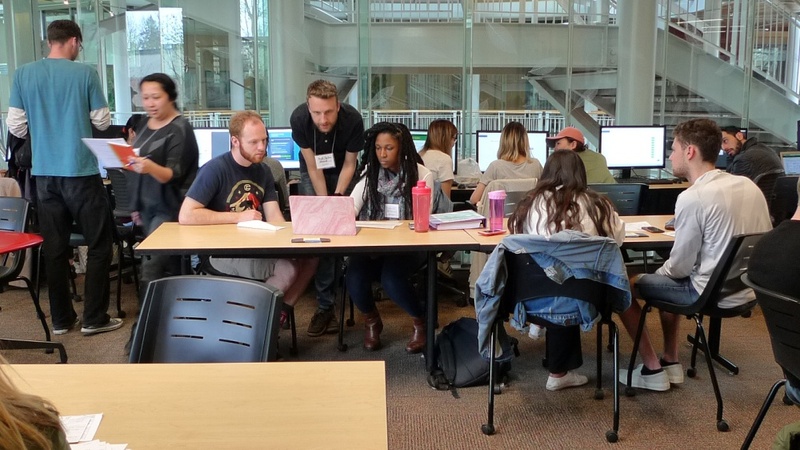 The Volunteer Income Tax Assistance program, known as VITA, offers tax return preparation by trained University of Oregon accounting students. Student volunteers undergo online certification exams in order to provide assistance to the public. “For students, not only does the experience look great on a resume, it’s an opportunity to make friends in the accounting major and expand your professional network,” said Ella Wang, vice president of external affairs for Beta Alpha Psi, the honors organization for financial information students and professionals that presents VITA each year. Last year, the group was able to increase its total number of tax returns prepared in part due to a more robust marketing strategy, including banner signage on 13th Avenue and table tents in the Erb Memorial Union. Along with those measures, Wang said Beta Alpha Psi this year expanded its digital slide displays to even more locations across campus. Wang said her focus for 2019 is on not necessarily on quantity — though she wouldn’t mind exceeding last year’s total of 223 returns prepared — but quality. She would like to reduce the rejection and amendment rate to an all-time low of less than 2 percent. This year, the group has expanded services to include simple tax return preparation for international students, faculty members and staff. To check to see if your tax needs may be met by this service, email Wang at uobap.externalaffairs@gmail.com. Visit the Beta Alpha Psi website to see which materials you need to bring, sign up for assistance and learn more about the scope of services offered. The VITA program at the University of Oregon began nearly two decades ago. Instructor of accounting Shannon Dolan, then a student and president of Beta Alpha Psi, was contacted by an IRS representative looking to launch e-file and free tax preparation on college campuses. Dolan and another student, Tracy Fisher, agreed it would be a natural partnership and launched the VITA program in the 1999–2000 academic year. Dolan currently serves as faculty advisor to Beta Alpha Psi. Accounting students still have time to join the VITA effort, and future employers like to see extracurricular activities that show accounting skills at work, Wang said. Simply use the online preparation materials, take the online exam and email Wang proof of certification.